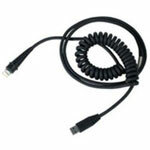 Honeywell Cable - USB, black, Type A, coiled, 2.6m (8.5'), external power. Non-Cancelable/Non-Returnable. The Honeywell 42206416-01E is also known as HHP-4220641601E	or 4220641601E	.